Robert Marion was born in Redlands, CA in 1956. Retired from the U.S. Navy after twenty years of honorable service. In the military he travelled to twenty different countries. His father's short story Titled Blue Eyed Cherokee was about growing up as a half Cherokee Indian in the farmlands of Alabama, inspired him to do some writing. His first Tana-Waka series books were based on that inspiration. "Warriors Honor" is a rewrite of a book that was originally published as 'Lines You Do Not Cross'. This work was completed while home bound taking care of his terminally ill wife of 39 years who required in-home care 24/7. Remarkably, his life has since mirrored the character in that book. He traveled to Cebu, Philippines to complete the promise he made to his dying wife. To find her family in the Philippines. 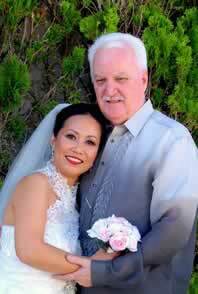 He did find them and he, like the character, found his new bride Mrs. Marlyn Marion. Marlyn was a forty-two year old, single mother, who had her fill of internet dating sites. After six sites, and five years, she had almost given up trying to find a decent, sincere man. To please a friend she joined one more dating site. There she met Robert and their story starts to unfold... Their true romance story titled "Finding My Rainbow" is now published. Co-authored by Robert & Marlyn Marion they provide a candid and insightful look into the world of International Dating and the Visa process for foreign brides entering the United States.